2012 Messages is a collection of detailed predictions and insights from notable psychics, channels and intuitives about 2012 and beyond. 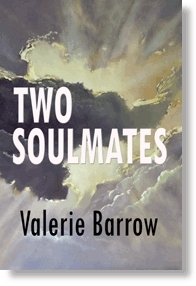 One chapter contains the work of Valerie Barrow. We are headed into new territory where there are new rules. Humanity and the Earth itself are evolving now—a lightening fast quickening—and we are being offered the chance to take back our power and use it to create a New Earth. 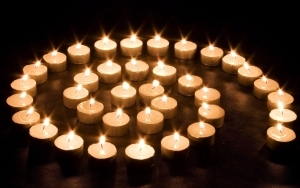 We are waist-deep in this transition and the road ahead may be rough for a time, but through foreknowledge, spiritual understanding and the release of the fear of change and the unknown, we will all be a part of the birth of a new consciousness. 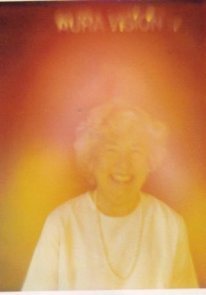 Gathered from over a dozen psychics and channelers, intuitives, even the Mayan Elders themselves, comes needed information about the time period we are living in right now – 2012. 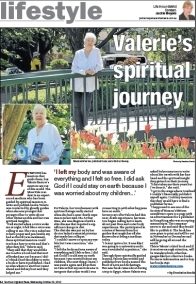 Valerie Barrow has been a light-worker for many years. 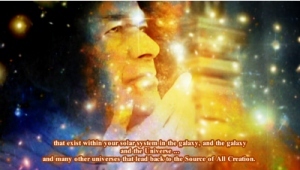 Author Craig Howell has included material from the Cosmic Sai Baba, as channelled by Valerie Barrow. The author also mentions how helpful the messages given by Alcheringa have been. Is this the “End Times”, or just the end of a time and the beginning of another? 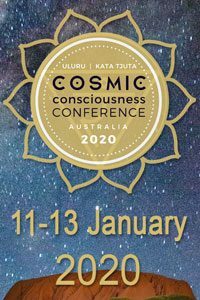 The sources say we are at the threshold of the birthing of a new consciousness, but with birth comes upheaval as the old ways struggle to remain in a new world where they have no place. We are in this transition from the old to the new. It is coming on so quickly, we will barely have time to catch our breath between the massive changes that are about to occur in our economic systems, on the earth and within ourselves. This time has been foretold in prophecy after prophecy for thousands of years, but known mostly through the attention on the Mayan Calendar called The Tzolkin, which some say ends on December 21, 2012 after over 5200 years. This has caused great fear and uncertainty among the masses. 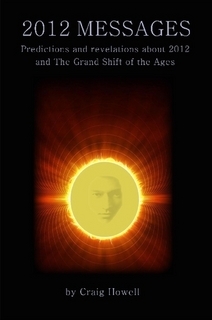 This book answers many questions about this year and this time period we are in: A Grand Shift of the Ages. There are many possibilities, but one thing is certain: after the transition is complete, things will never be the same again. What may happen on December 21, 2012? 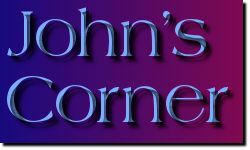 Will there be a pole shift or magnetic pole reversal? Is time speeding up as the Earth’s rotation slows down? Are we entering a “time of truth” where all will be revealed? Will this be the year of almost instant manifestation of our focus? Are we at a crossroads in our evolution and which path will we choose? 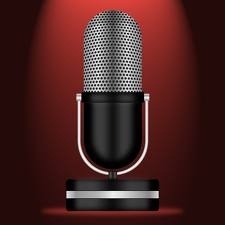 How could releasing fears about 2012 be your best protection? Could the world financial system shift to a new model? Will we witness the start of the collapse of the political system in the U.S.? What wild weather or earth changes could occur and where? Are we shifting along with the Earth into a higher dimension? Could a massive solar flare create havoc with our grid? What are the Mayan Elders messages to the world from their own prophecies and teachings? Craig Howell has been a published writer since 1993 when he created and published his holisitc/metaphysical monthly publication, “The Wheel” He has since created four books: “A Flower Unfolds” (spiritual giftbook), “Through the Eyes of Kwan Yin” (Q&A with a Kwan Yin channel), “Spiritual Teachings for Young Souls” (basic teachings for teen empowerment) and “2012 Messages”. He has contributed to many publications online and in print, most recently in Dell Horoscope Magazine. This book is available in several versions. You may order this book online. 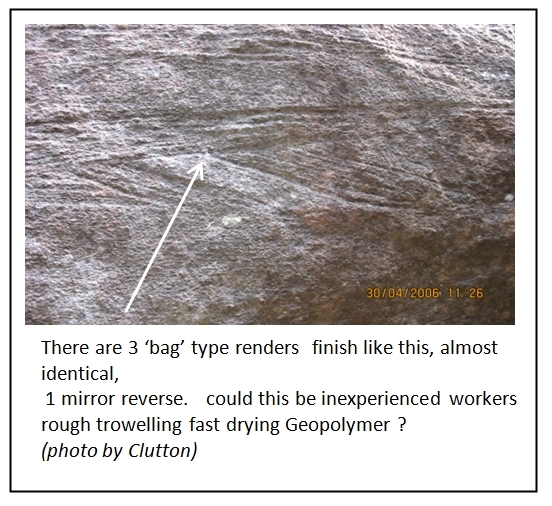 Could this be GEOPOLYMER RENDER ? 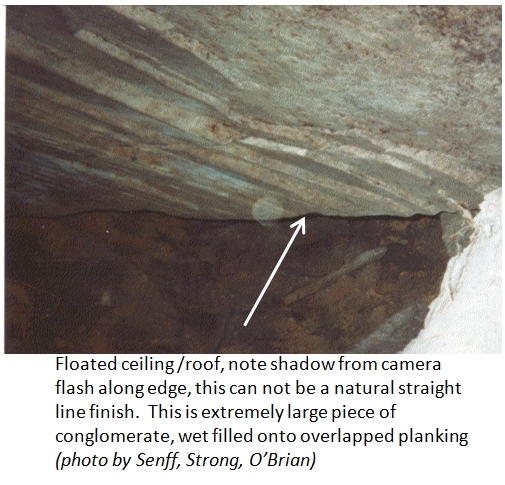 Some claim this to be installed vertical sandstone plate, manufactured ?, maneuvered ? from where? — When? — How? I, Robert Clutton after 12 years of research asks, is this a picture of the rare and ancient form of ARI-KAT (man made) render? ARI-KAT technology? older than the Pyramids themselves!. 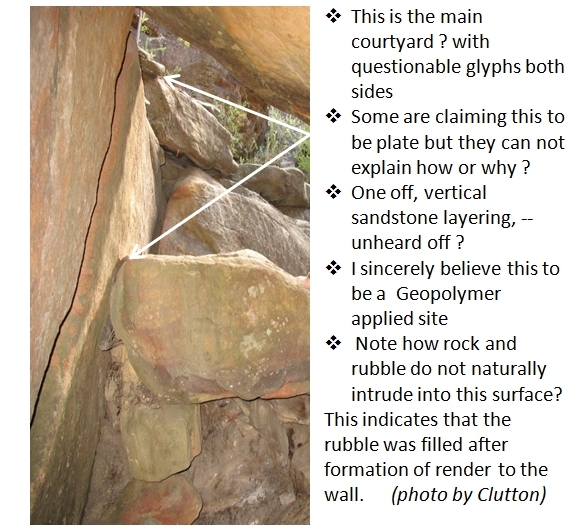 Controversy, mystery, even Dream stories have surrounded the much suspected hieroglyph site at Gosford over past decades. 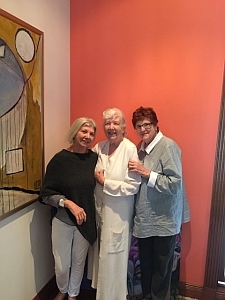 Return soldier recluse story, 1970’s students story, even use of one in-place item as women’s secret birthing story, decades of persons scratching around in the confines of the suspected history site up in the hills off Bambara Rd. The hieroglyphs, be they authentic or not, are on the walls. Translation of which has been systematically researched by Hans von Senff from Swansea. In turn his interpretation has been checked with great interest by other Egyptologist and authors. Now after my numerous visits, catalogues of digital pics and hundreds if not thousands of research hours later, I believe it is time we questioned the blackboard not the script. My research placed too much emphasis on the trough item itself instead of its use. I had searched the archives of associated and obvious acclaimed cultures looking for an similar ancient artifact . Two months ago I realised this trough was just an insignifient implement used in production of render. Render which was obvious in many of our above and below ground digi-pics, I searched the web for ancient renders and a new world door opened. This from ancient cultures who collectively calculated date calendars, charted the heavens and the Antarctic seas, desalinated seawater, fed thousands from the desert, found formula to laminate wood, devised toothpaste and eventually invented the wheel. We, the uneducated, question could their Geopolymer cement really look like rock? 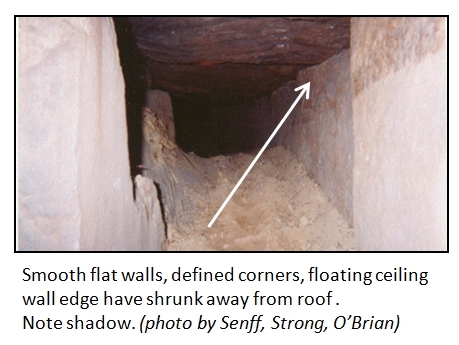 Dr Davidovits website and books reveal how Ancient Egyptians built the pyramids using man-made stones, which don’t shrink, look and react exactly like natural rocks and stone biota. Geologists using sophisticated petrological equipment are hard pressed to distinguish Geopolymer from natural stone. Geopolymer is composed of an alumni-silicate amorphous mineral making it more akin to man made granite. It is not smoke and mirrors, ingredients are available most anywhere. It was the combination, procedure, the actual formula which was surrounded in secrecy. Davidovits book “The Pyramids, An Enigma Solved” takes away supposition guess work and with todays electronic calculation capabilities, brings Pyramid pour n’ pack construction to a more feasible, realistic construction timeframe. TOOLS —- Copied from Davidovits book. Page 71, The Feasibility? states: Quote: The implements needed were simply those used to lay sun-dried mud bricks, a hoe to scrape fossil shell for limestone, a basket to transport ingredients and a trough in which to prepare ingredients, (End Quote) Numerous other items mentioned in this chapter would be associated to pyramid construction. How does any of this equate to Kariong ?, –? 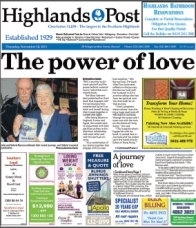 Check out the www yourself, Kariong, Tascot, Bris. Waters, Woy Woy even the Hawkesbury all contained the basic ingredients, fossil oyster shell, Eucalyptus gum, Chlorophyll leaves, black silt sand, pink sandstone, ironstone, Natron (salt) the requirement list goes on and on. Regardless of what age culture Old, Middle or New Kingdom visited our shore the product they left behind is in our face. Open eyes and open mind, it’s a new dawn of education. There are far too many out of place signs at Kariong. Signs that are not Hieroglyphs or story, yet it takes an old dreamer like me to bring this history to the table for questioning. Without the internal shaft pictures from Senff, Strong or O’Brien which all expose wall and roof render and linings, there is still much to see and learn above ground. Senff translated from the Johnson papers, Johnson was corresponding with qualified Egyptian researchers. 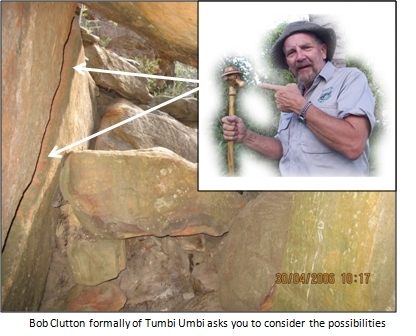 (written proof) But Johnsons introduction and involvement with the Kariong site is still unclear. Digital photography and electronics enables us to qualify a large percentage of the Kariong glyphs, which questions the application of said glyphs? If the “Old Kingdom” transcript is correct then basic application could not apply. It is proven that hardened copper hand tools which were used for the lime plastered interior of pyramid chambers could not perform the task required on exposed Egyptian let known external Gosford pink(?) sandstone. If we step forward to the New Kingdom the “small brick period”, an era of hardened metal almost capable of scouring pink(?) sandstone. Maybe we have to re-align the translations. 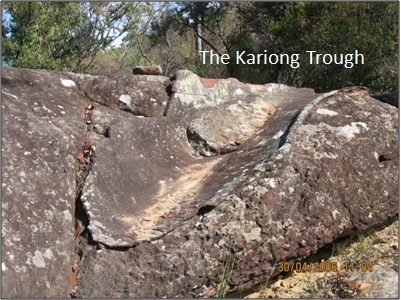 Bronze age period tools could not cut with precision or definition displayed in some of the Kariong glyphs on pink stone walls with a limited half skilled work force and no mistakes. 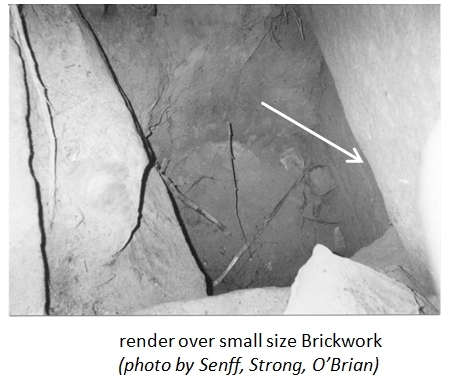 If we apply the capability and flexibility of a Geopolymer type render, then all precision script can be achieved on the rapidly drying render, the small intricate circles which are not exhibited in tomb or lime based rendered chamber work, nor sharp definition of pointed corners could have been achieved by inexperienced scribes at Kariong. The picture A051, shows more than expected, note how the outline is deeper than the centre section which eludes to having been recently extracted, this also indicates vertical layering of my suspected render. In the pic 0189 the fine stick childish like scribed lines are precise, yet definite, a sharp copper hand tool could have been used to etch, not hammered, more likely carved into wet and setting render by semi skilled workmen following the High Priests chalked or charcoaled story guide. In my opinion this is why there is mixed execution of the glyph skill work applied. (note) In the period “Old Kingdom” the use of Cuneform or Hieroglyph dialect was the exclusive aptitude of high priests culture. Kings, Queens, Pharaohs were illiterate to any script. Is this Result of Rapid Hydraulic Setting Render ? Sandstone is sedimentary, it can have a natural grain or undulating lateral paten markings or both. This is not the case exampled in photos A,B,C. It is my belief that these surface markings were caused by an attempt to smooth out damp render. The obtuse markings are overcut by the horizontal indentations, in some the left hand end being more distinct than the right, this fades away to the right side peak and indicates that the worker has lifted hand pressure off as they swept or smoothed toward their right. The brush style marks seen here are not tool sharpening. Scribes would be defacing over the pre-marked inscription. They would not dare sharpen tools on the surface they are etching, there are other obvious sharpening marks on other rocks close by. Nor have these marks been caused by the method of rock or sandstone smoothing, to many uneven indentations. I believe this is quick drying but still damp Geopolymer mixture, a select minority of unskilled workers would have been on the glyph application, with bulk of workers preparing the surface an hour or so aheadof scribes? Remembering that this event was important enough to be recorded, but in a far off distant land and may never be seen again, like the trough, cleaning up or perfecting the unwritten word surface may not have been a priority. But man does leave his mark! 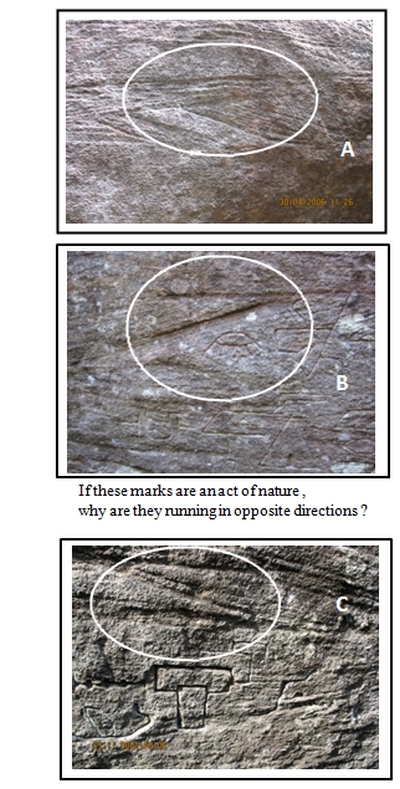 Nothing in the images below is natural, The first three photographs are verified correct, by researchers Senff, O’Brian and Strong. I have been researching this site for 11 years, I believe that 75% of the glyphs on the external courtyard walls, are Cuneform style carving into damp fast setting render ? The two images below are taken by Clutton. You can physically go to Kariong and see the render for yourself. Tour guide Jake Cassar maybe happy to detour a bit and educate you. You have ability to Google “Geopolymer” or “Ancient Renders” on the www. Your ability to view the credentials of this world renown Pyramid Construction Scientist. France, USA, Japan, Russia, Germany and Egyptian scientists align agreement with Davidovits Geopolymer pyramid construction theory. Dr. Davidovits inspects our verified Kariong Digital pictures and voices his opinion. Dr. Davidovits 6 simple word statement gives us reason to rethink any hoax claim. QUOTE: — “It is artificial —- It is coating”! He went on to state This could be 50 to 10000 years old, were we sure that it is not Portland cement-based ? as he stated — “It is artificial —- It is coating”! 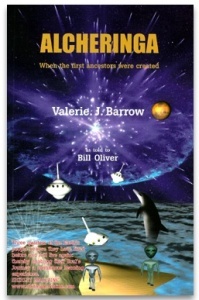 It fits with our story Alcheringa gave us of the starpeople evolving the up-standing ape like creature into the first human nearly 1,000,000 years ago. Researchers have discovered a new gene they say helps explain how humans evolved from apes. It is known that most differences between species occur as a result of changes to existing genes, or the duplication and deletion of genes. But, according to scientists, this gene emerged fully functional out of non-coding genetic material, previously termed “junk DNA”, in a brief interval of evolutionary time. Archaeologists in Bulgaria have discovered the oldest prehistoric town ever found in Europe, dating back to the fifth millennium BC. An ancient salt production site was also found at the Provadia-Solnitsata settlement located in the country’s east. 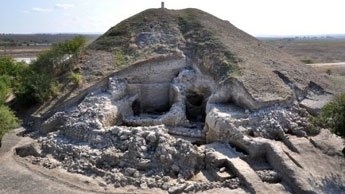 Archaeologists in eastern Bulgaria say they have unearthed the oldest prehistoric town ever found in Europe, along with an ancient salt production site that gives a strong clue about why massive riches were discovered in the region. 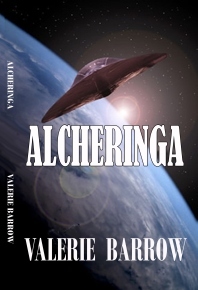 Finally, the shipment of the reprint of my second book Alcheringa, When the ancestors were first created has arrived. 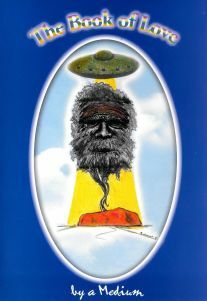 We are pleased to offer a promotion of 2 books for AUD $20.00 Alcheringa, when the first ancestors were created and The Book of Love, by a Medium. So send me your order on our Book Order page and I shall write to you. There are already changes happening gradually in this world that are a little more difficult as the time comes to the ‘turning point’, which is at the end of this year. However, that does not mean that everything comes to an end – far from that – it means merely a change. That is all. In fact things – as the rise continues – will become easier. People will be easier to get along with. Peace will eventually reign upon this Earth. It will be a little slow – but it will happen. The energy of the Earth will change a little more quickly and She will be happy. For things will flow and grow much easier upon her body. and bringing everyone into the Light of God. Blessings be with you and Universal love. Val. 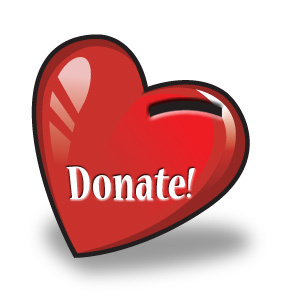 Material from other websites may not necessarily be endorsed by Valerie Barrow nor her website. 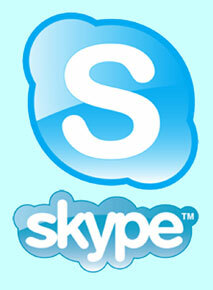 Material from other websites is reproduced here for interest, only.